Here follows a text wherein the stages of meditation. I quote the whole text since its clear and very helpful. For me this shamatha practice is the basis of my daily activities. The Tibetan word for Shamatha meditation means calm abiding or Shinè. The practice of Shamatha meditation develops the ability to focus the mind in single-pointed perfect concentration and is a prerequisite for the development of vipashyana or analytical insight meditation. Shamatha meditation should ideally practice in an isolated place and one should seat in meditation posture of Vairochana Buddha. The object of concentration is usually the image of the Buddha or a deity. The illustration of the development of mental tranquility is brilliantly depicted in this thangka in nine progressive stages of mental development which are obtained through the six powers of study, contemplation, memory, comprehension, diligence and perfection. The first stage is attained through the power of study and or hearing. The monk fixes his mind on the object of concentration. Here a monk chasing, binding, leading and subduing elephant whose colour progresses from black to white. The elephant represents the mind and its black colour the gross aspects of mental dullness. The monkey represents distraction or mental agitations, and its black colour, scattering. The hare represents the more subtle aspect of sinking. The hooked goad and lasso which the monk wields represent clear understanding and mindful recollection. The progressive diminishing along the path represents the decreasing degree of effort needed to cultivate understanding and recollection. The five sense objects represent the five sensual source of distraction. The details are as follows; As mentioned above, the monkey represents mental agitation; its black colour distraction. The monkey at the first runs a wildly, leading the elephant. The second stage is attained through the power of concentration. This is achieved by lengthening the periods of concentration on the objects. The five senses of touch are objects of distraction. Beginning at their heads, the elephant and monkey begin to turn white. This shows the continuous progress in fixing and holding the objects of concentration. The third and fourth stages are attained through the power of memory or recollection. The monk lassoes the elephant fixing the wandering mind on the object. The hare, which now appears on the elephant’s back, represents the subtle aspects of sinking. Here one is able to differentiate between the gross and subtle aspects of sinking. The elephant, monkey, and hare look back; showing that having recognized these mental distractions, the mind turns back to these mental distractions, the mind turns back to the object of concentration. The meditator holds a clear and detailed conception of the object. Attainment of the fifth and sixth stages of meditative absorption is achieved through the power of clear comprehension. The monkey now follows the elephant; the arising of distraction diminishes. Even the arising of virtuous thoughts must be perceived as a distraction from the object of concentration. The monk hooks the elephant with his goad; the mind is stopped from wandering by clear understanding. The mind is controlled. The hare disappears and the mind is pacified. The seventh and eighth stages are attained through the power of energetic perseverance. The monkey leaves the elephant and now squats behind the monk in complete submission. However there are still slight traces of black; this shows that even the subtlest sinking and scattering may continue to arise. Should they begin to arise they can be eliminated with the slightest effort. Now the monkey disappears and the elephant becomes completely white. The mind can now remain continually in absorption on the object of concentration, Single-pointedness of mind. The ninth stage of mental absorption is attained through the power of perfection. Perfect equanimity, the path has ended and elephant is at rest. From the heart of the meditating monk emanates a rainbow like ray. The monk rides the elephant; the attainment of shamatha. Riding the elephant across the rainbow; mental bliss. The monk wield the flaming a sword of perfect insight, and rides triumphantly back along the rainbow; samsara’s root is destroyed by the union of shamatha and vipashyana with emptiness as the object of contemplation. Control of the flame supreme mindfulness and understanding represents the ability to examine the sublime meaning of shunyata. The upper part of the illustration, where the rainbow emanates from the monk’s heart, represents the tenth and eleventh stages of transcendental mental absorption. The tenth stage of bodily and mental bliss is symbolized by the monk riding the elephant. 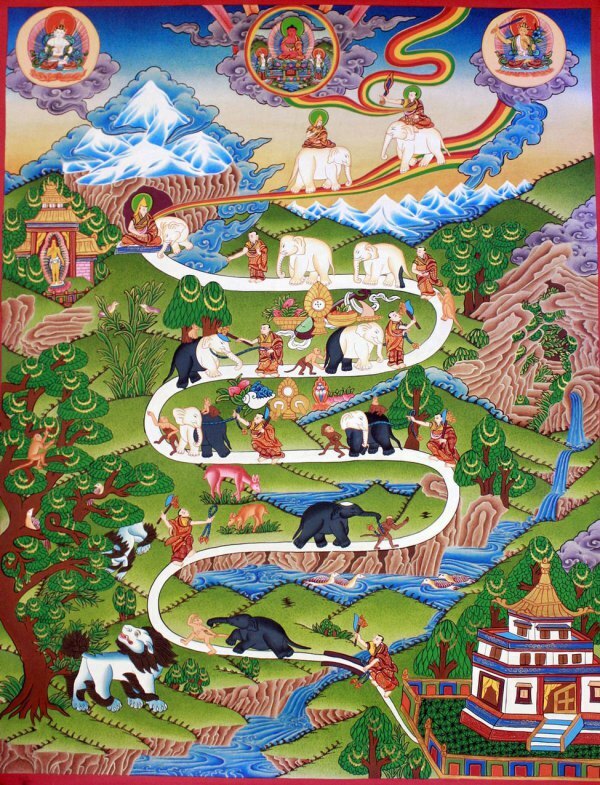 The eleventh stage is represented by the monk riding the elephant back across the rainbow. From the monk’s heart emanates two dark rainbows, which the monk is just about to cut asunder with his flaming sword of wisdom. There two rainbows represent karmic hindrances and mental illusion, and the obscurations of the instincts of mental distortion.